Multi Institute Management can manage all institute activities in a single site. MIM is a completely web-based online Institute management system. This plugin can manage multiple institutes directly from your WordPress website. 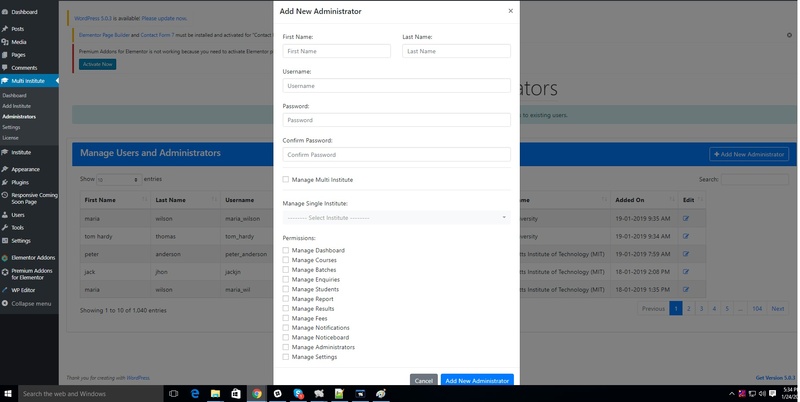 Also, you can assign admins to manage individual institute. It is an Education Management Software that will provide you with a powerful solution for the entire educational institution. It is a management information system which helps to manage the different processes in any educational institution. Multi Institute Management provide 4 dashboards. 1. Super admin => Can manage and view all the institutes, add new institute, assign admins and modify all details of the institutes. 2. Admin Dashboard => In this dashboard, admins can manage all the activities of a single institute assigned to them. 3. Staff Dashboard => Staff can perform all activities of institute assign by admin. 4. Student dashboard => Student can view notices, study material, exam results, pending Fees and deposit the pending fees via Payment Gateway such as Stripe, PayPal, Razorpay etc..